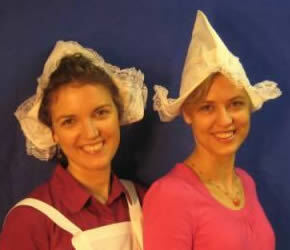 A Dutch Cap also know as the Dutch Bonnet is a style of woman’s hat associated with traditional Dutch woman’s costume. A Dutch Cap is usually made of white cotton or lace, it is sometimes characterised by triangular flaps or wings that turn up on either side. It can resemble some styles of nurse’s hat.